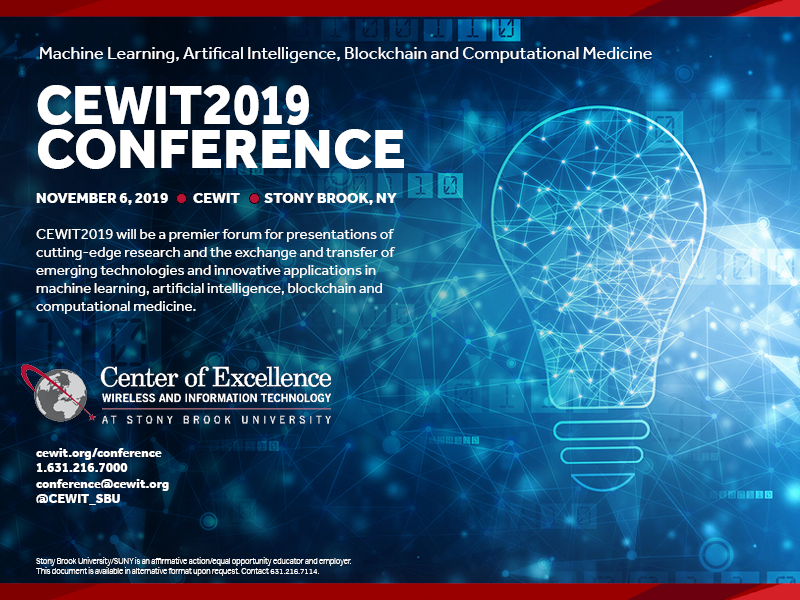 CEWIT2019 will center on technologies and innovations in Machine Learning, Artificial Intelligence , Blockchain and, Computational Medicine . Organized by the New York State Center of Excellence in Wireless and Information Technology (CEWIT) at Stony Brook University, our international conference is a destination for researchers, innovators and entrepreneurs, across borders and disciplines. Last year’s CEWIT2018 conference attracted over 180 industry and academic participants from 6 countries. Over fifthteen presenters took the podium in various breakout sessions. CEWIT2018 also hosted 30 US and international exhibitors across many industry sectors, ranging from software and telecommunications to healthcare, media and law. Continuing the tradition since the inception of our conference in 2003, CEWIT2019 will be a premier forum for presentations of cutting-edge research as well as the exchange and transfer of emerging technologies and innovative applications. We are expecting renowned speakers, presenters and panelists from industry, academia and government, in a series of plenary presentations and discussions - all for an international audience ready to network! We look forward to your participation in this exciting event! To register, click here. 1 day conference beginning the morning of Wednesday, November 6, 2019.